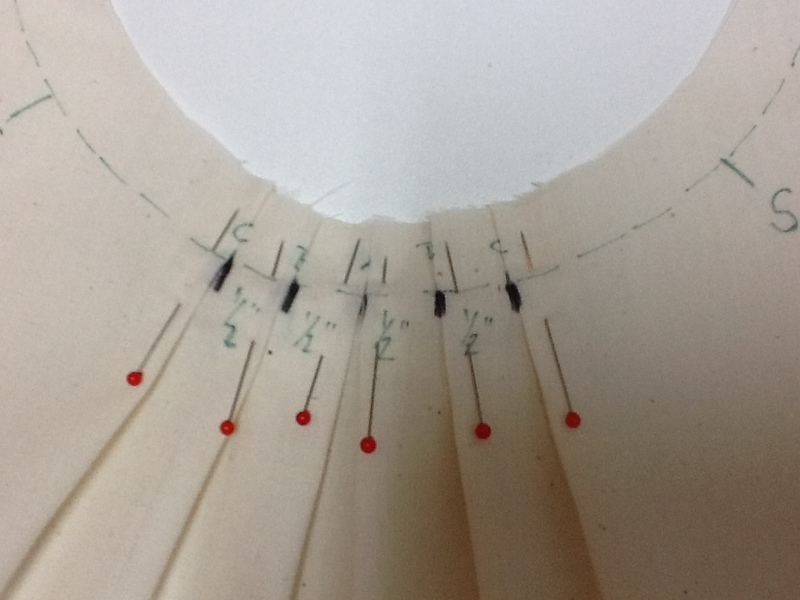 I’ve received a few requests to elaborate on how I pleated the front neckline of the Marfy top pattern. Here is the step-by-step process. The top front cut in muslin. I’ve marked the seam lines. Starting at the center front, mark 1 and 1/4 inches away from the center front on both sides. 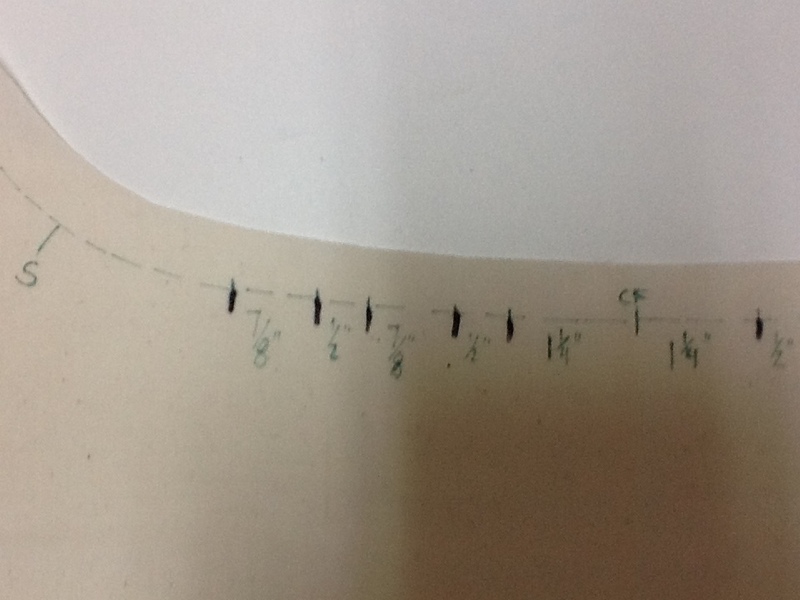 Label both these marks and the center front “A.” Make another mark 1/2 inch away from “A” on both sides. 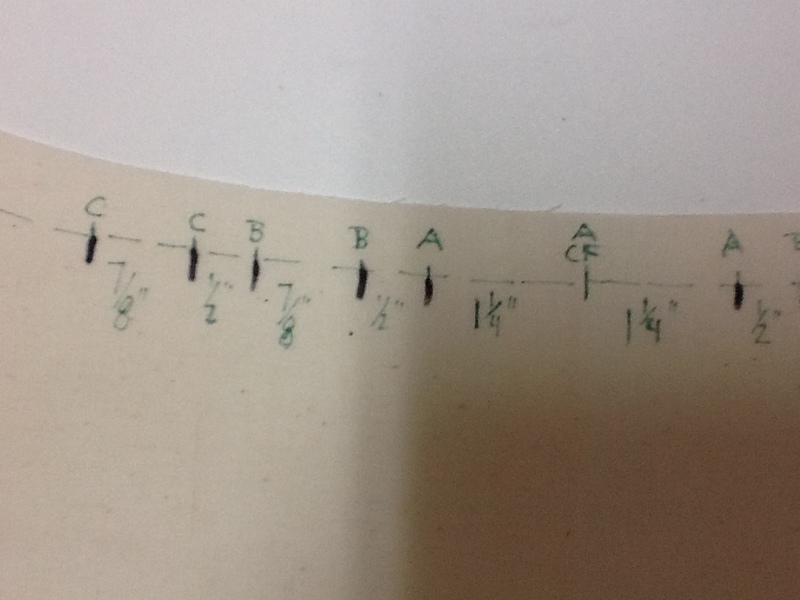 Label this mark “B.” Another mark 7/8 inch away from “B” and this is also labeled “B.” Another mark 1/2 inch away from the second “B” and this is “C.” Finally measure out 7/8 inch from “C” and mark another “C.” Your top should look like this. Now bring both “A”s together meeting at the center front. Fold another pleat so the “B”s meet. Then the “C”s. Do this on both sides of center front. Finished pleating. Baste on the seamline. Don’t press flat. The inverted pleat at the center front prevents the fabric from poufing out too much. I liked this look better than gathers. I hope this make sense. If not let me know what is unclear. Thanks for all your comments. Here is my version of Marfy 1913, a free Marfy pattern offered on their website. Leisa from A Challenging Sew.com started a sewalong using the free Marfy patterns. Sarah on Goodbye Valentino.com is also following the sewalong and has posted her interpretations of the top. Sarah has also started the Ready-to-wear Fast and participants pledge to refrain from buying ready to wear clothing during the year. I figured it was a perfect opportunity for me to make a dent in my fabric stash. I am a fan of Marfy patterns as they are expertly drafted and don’t have the immense amounts of ease that most patterns have. The styling is up to date and they don’t include seam allowances, which drive me batty. Once you get used to using patterns with no seam allowances, you’ll never go back. I found a length of about 3/4 yard of an exqusite Leonard silk print in my stash which was perfect for the high collared, cutaway armhole top. Leonard prints have a distinctive narrow border running along one edge. My goal was to incorporate the border as trim. The decorative border is broken by a white line every 0.5 meters and I had only about 0.75 meters so the trim would be limited. I decided to use it as a top border around the high collar and miter the edge. 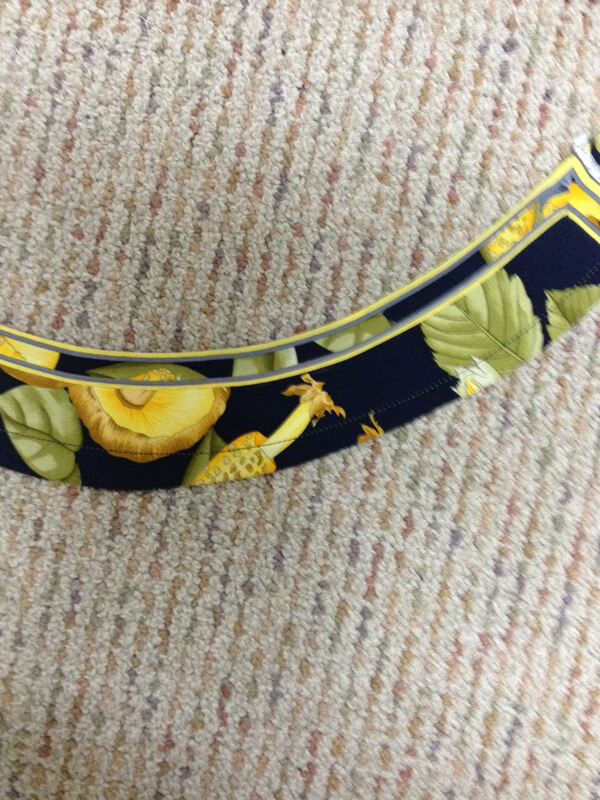 Since the border was along the lengthwise grain I wasn’t sure if I could curve it to match the pattern. I disliked the fullness created by gathering the neck edge and decided that inverted pleats would give fullness yet lie smother. 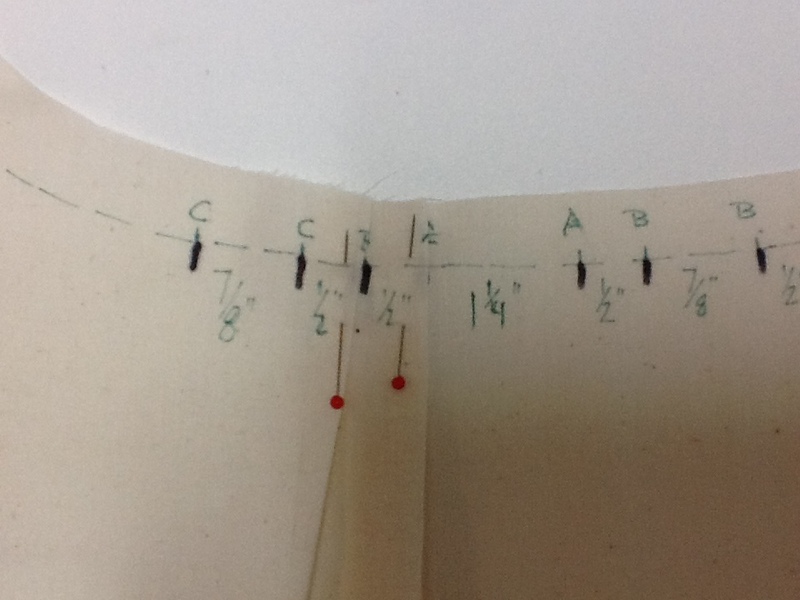 I experimented with the muslin and came up with the following measurments for pleating. 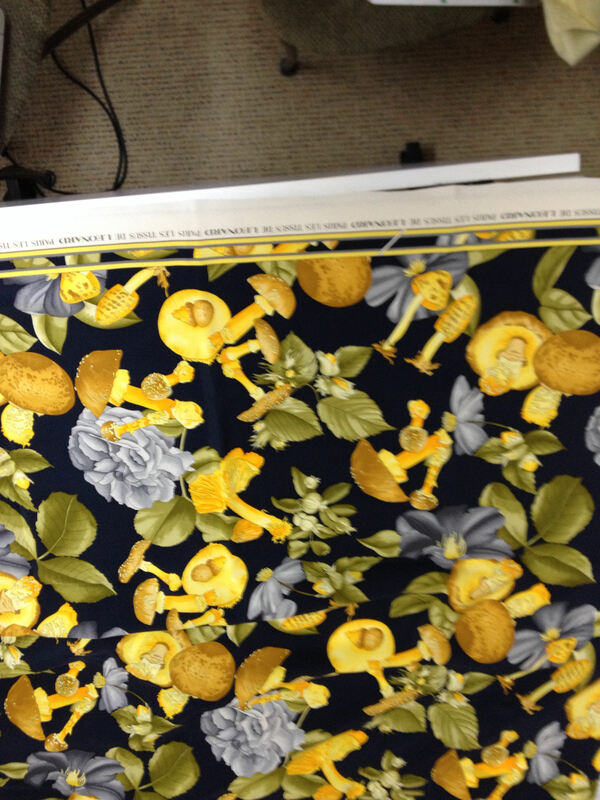 There was 3 inches excess fabric each side of the front neck; total of 6 inches. The pleats took out 1 and 1/4 inches at the center front, space of 1/2 inch; then 7/8 inch taken out, another 1/2 inch space; another 7/8 inch out. 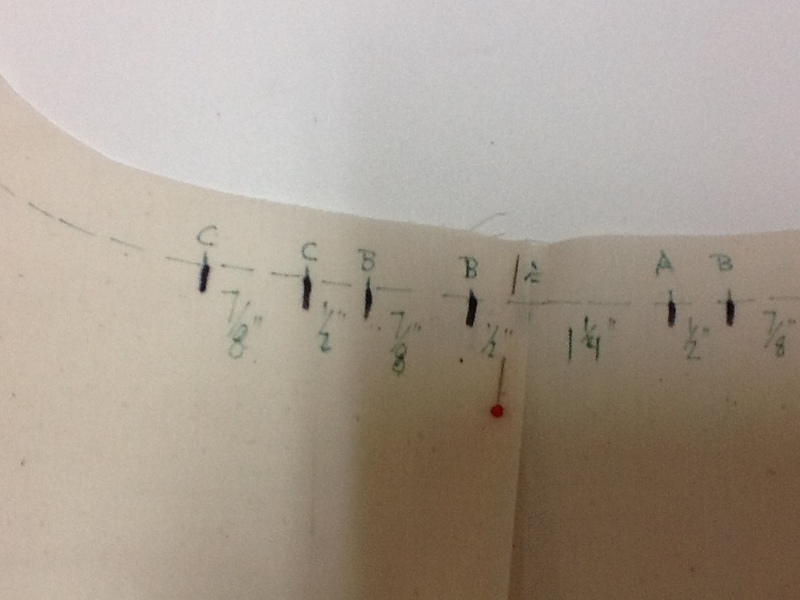 Here is the redrafted front neck with pleating marked in red. I also decided to eliminate the back opening and close the neck with tiny self-covered buttons. I shifted the left shoulder seam 1 inch towards the front. This was accomplished by trimming 1 inch off the left front shoulder and adding it to the left back shoulder. This shifted the buttons slightly forward making it easier to button once on the body and also looks better than having the buttons at the exact top of the shoulder. 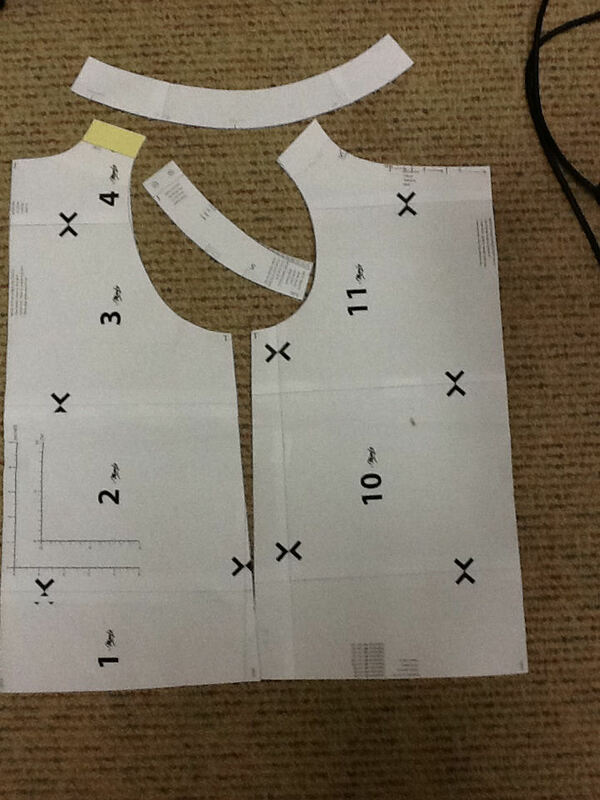 The collar pattern was also redrafted to shift the opening 1 inch forward of the left shoulder seam. 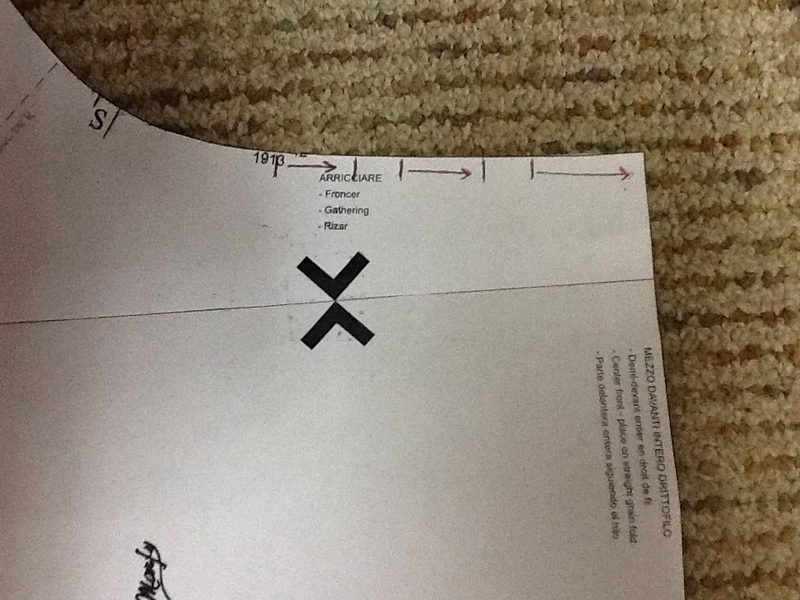 I cut a full collar pattern from paper, taped it together at the center fronts and center backs and cut 1 inch forward of the left shoulder mark. The collar was the most time-consuming part of this project. 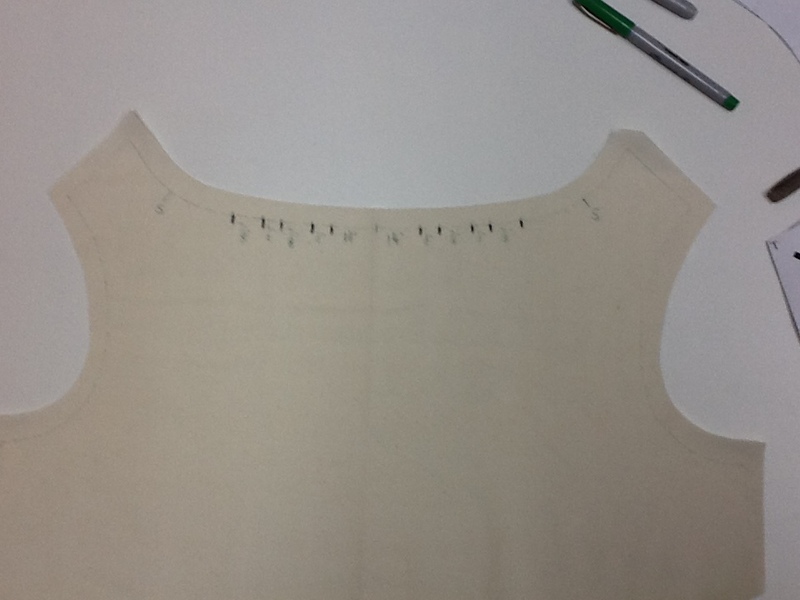 The border was cut, pressed under and steam shaped to match the curvature of the upper collar line. It was basted and then machine stitched into place. The top corner was mitered. 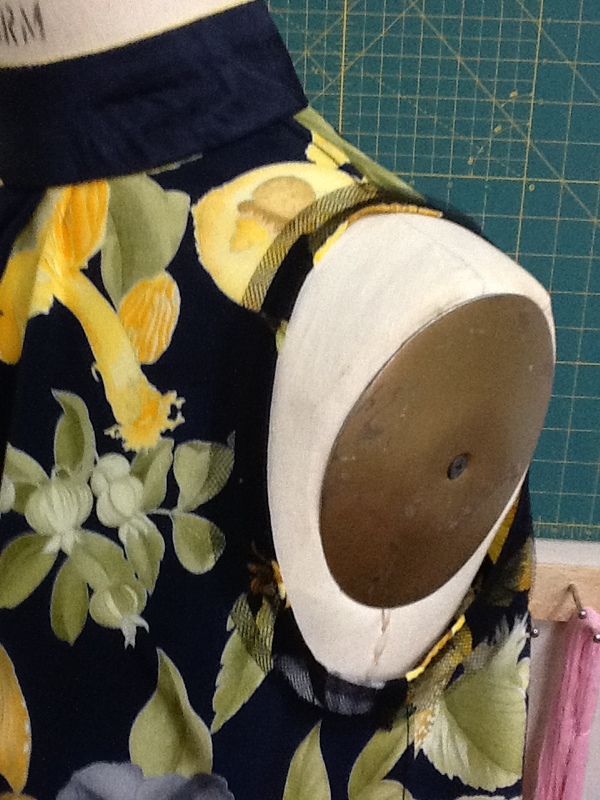 I used the paper collar pattern to accurately stay-stitch the lower edge of the collar where it attaches to the blouse. To form button loops, bias strips of of fabric are folded right sides together and stitched about 1/8 inch from the folded edge. Stretch while stitching. Trim the seam to 1/8 inch and turn. 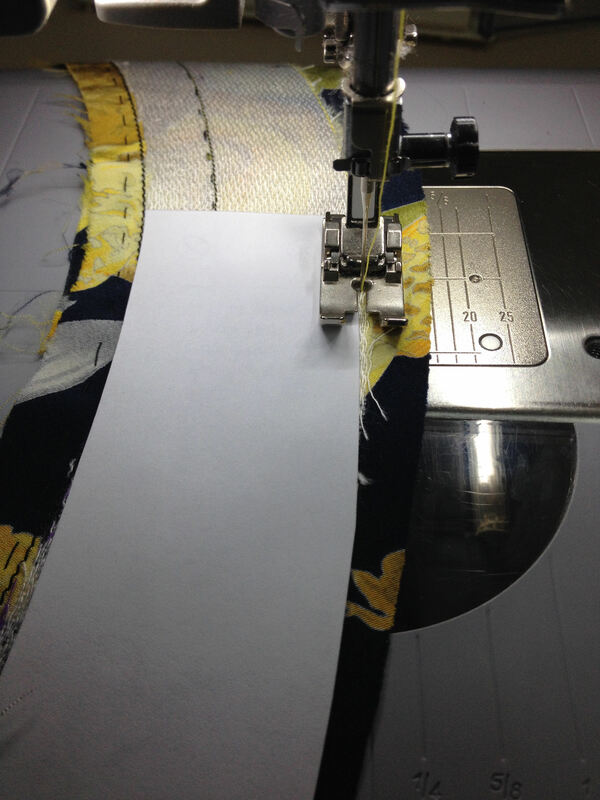 Pin one end of the narrow strip to your presing surface and stretch while steaming. 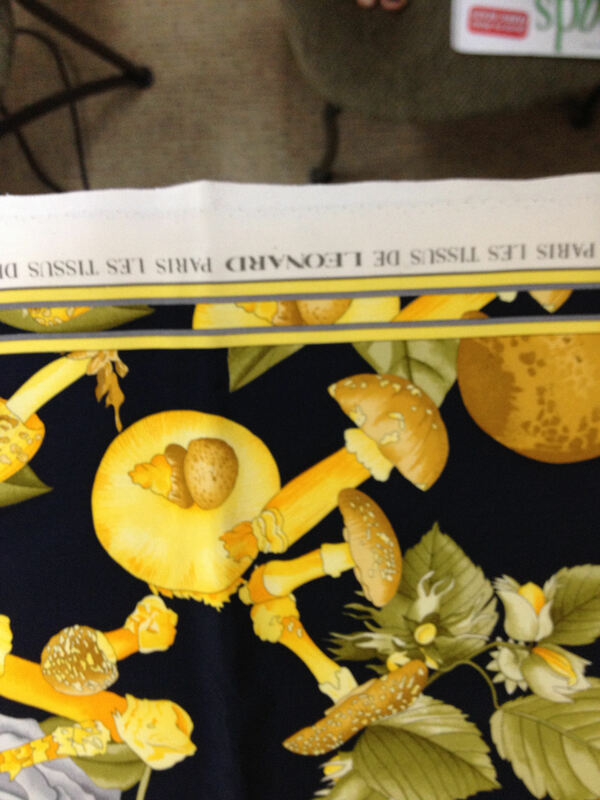 You will have a narrow tube of fabric which is used for the button loops. Tack the loops into place allowing just enough room for the button to pass through. I used two on the collar and three on the shoulder. My buttons are 9/16 in diameter. I used a fine cord to form piping around the armholes and finished the edges with a strip of black silk tulle which was doubled before attaching. After pressing the tulle was tacked at the shoulder and side seams. It stays in place with no further stitching. French seams close the shoulder and side seams. Rather than use elastic at the bottom edge, I opted to attach a band about 2 inches wide and pleat the excess fabric into the band. Here is the finished product. This Marfy pattern can be as simple or complicated as you want. 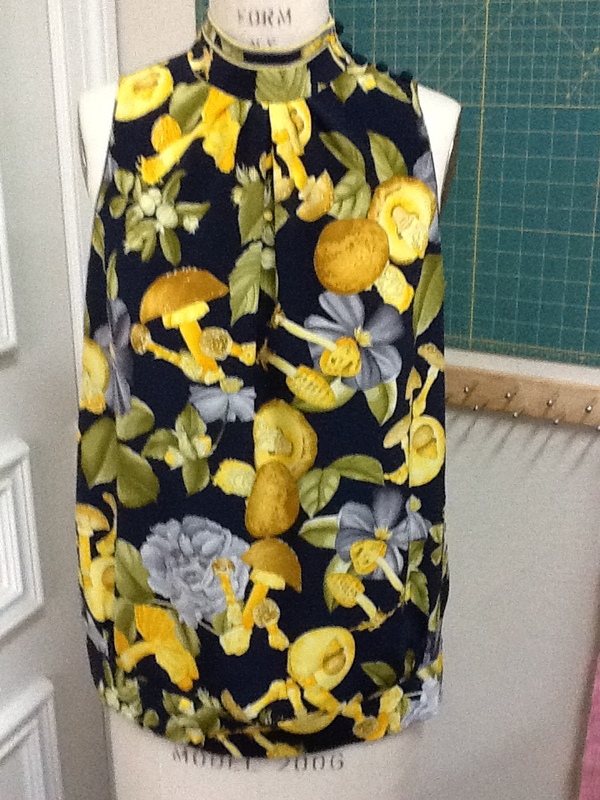 Made with plain seams, narrowly hemmed armseyes and a back slit opening, this can be completed in a couple of hours. 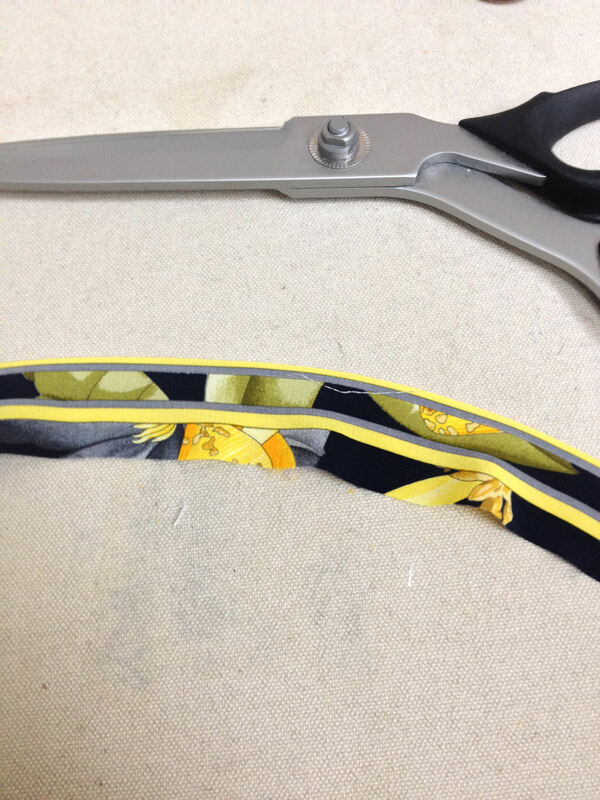 The elastic at the bottom can be eliminated if you want to tuck it into a waistband or simply leave it loose. The pattern can also be a canvas for intricate details.